Signed Surrealist Butterfly Painting from Brazil, "Yellow Butterfly"
By Brazilian artist Ricardo Siccuro, this painting depicts the surreal image of a butterfly. 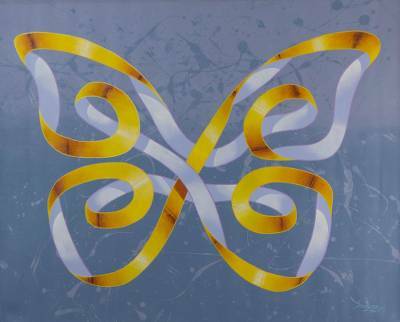 Against a pale blue background, the butterfly is formed of a single strip of yellow and white ribbon that curls in on itself to form this mesmerizing composition. Titled Borboleta Amarela in Portuguese. You can find 'yellow Butterfly' (2017) by Ricardo Siccuro in paintings categories such as Animal Themed Paintings, Surrealist Paintings and Acrylic Paint Paintings. Enjoy exploring these sections for other Novica treasures.